How Do I Choose Solar Lighting? - How Do I Do X? How Do I Choose Solar Lighting? Providing ambient barbeque lighting with solar lighting is becoming very popular because of the affordability of lighting units and negligible running costs. Normally, there is far less required to install the lights. Without the requirements of mains power, solar powered lights offer much more flexibility. 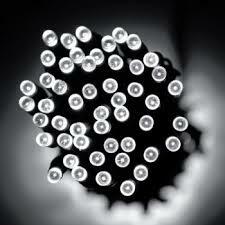 The use of LED bulbs in solar lighting units has improved the quality of the light emitted considerably. Solar lighting used to need substantial direct lighting in order to charge properly. Improvements in solar panel technology have led to improvements in the light required in order to harvest the suns energy. Solar technology is developing fast and is expected to continue to do so. 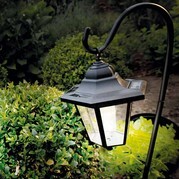 There are lots of options of solar garden lighting on sale. Lantern style lighting. Post mounted and hanging lanterns. A large variety of different fairy light designs. 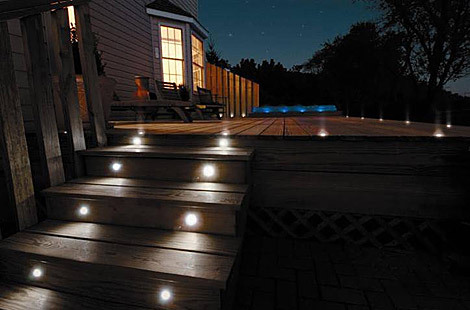 Recessed spot lighting for decking applications. PIR sensor solar security lighting. Some compact designs of solar lighting contain integrated solar panels. Other have a wired panel that can be positioned elsewhere to harness the suns rays. Each design has its own pros and cons and suits different applications. Solar lighting with external panels will usually charge faster and be more reliable because the panels are larger and can be placed in the best location to harvest energy. Factory fitted rechargeable batteries should be replaced with high performance, quality batteries as their will allow your lights to function better. Fitting high performance batteries will make your solar lights work for longer. Where you position your solar light units is also very important. The more daylight hours of direct sunlight your lights can receive, the better they will work. The performance of your lights will be massively affected by the length of time they are exposed to light, so the less time spent in shady conditions the better. Modern solar lighting will happily charge on wet, overcast days in the UK as there is still enough natural light to top up the batteries, however, something as simple as the shade from a tree can reduce the operating time significantly. Renewable energy technology is a huge growth area, with million being pumped into development annually. We can expect light performance to further improve as solar panel and battery technology evolve. Year on year, the sales of solar renewable energy products continues to rise. This entry was posted in Home & Garden, Lighting on April 23, 2014 by admin.